I love salads and have since I was a kid. Give me a good basic vinaigrette and I will come up with the craziest salad combinations. Whatever I have in the refrigerator or the pantry is fair game. Quinoa, fresh herbs, sprouts, cooked beans, last night’s leftover vegetables, rice, whatever! I always try to wash a few heads of lettuce and make a vinaigrette on Sunday so that a delicious salad is only minutes away any day of the week. The only tricky part about salads is making sure you’ve got good seasonal produce to work with. Lettuce is grown all year round in California, but tomatoes and cucumbers are not. So my winter salads tend to focus on things like avocados, fennel and citrus fruits. But I also love making winter salads with a base of something other than lettuce, such as kale or cabbage which are super fabulous at this time of year, and might I add super nutritious! Dr. Mark Hyman just came out with a new book called The Blood Sugar Solution Cookbook. I am a huge Dr. Hyman fan! I love his message about keeping blood sugar balanced, and I also followed his 30-day blood sugar challenge last year which had great health tips every day. I haven’t had a ton of time to really get into the new cookbook, but I immediately made the Asian Slaw since I happened to have all the ingredients on hand. Yummers! Cabbage is one of the most affordable and nutritious vegetables. It has loads if fiber, Vitamin C and beta-carotene which aids in tissue repair. It can also help to protect against tumors and inhibit the growth of cancerous cells. 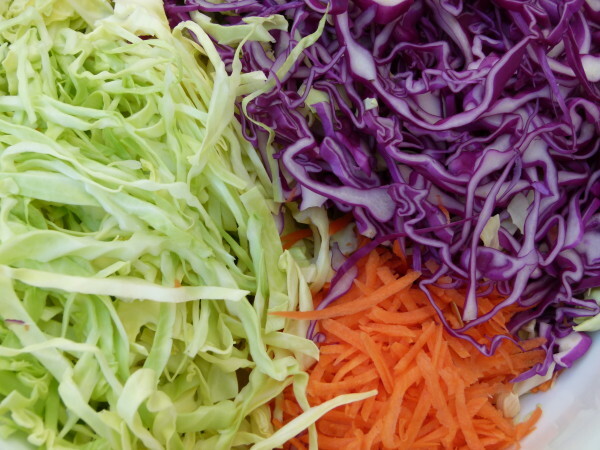 Another benefit, especially at this time of year, is that cabbage can stimulate the immune system. All good stuff! 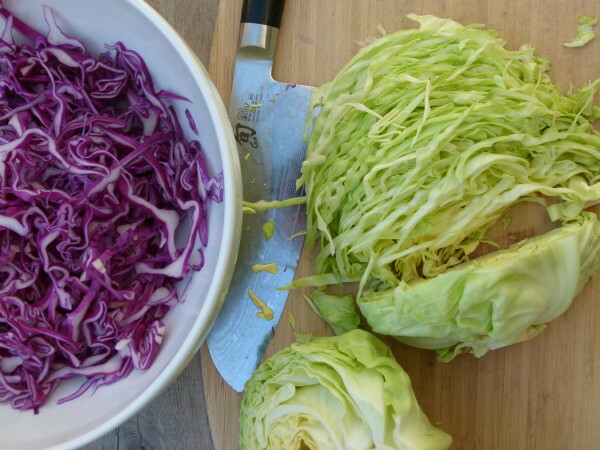 This slaw is very easy to make provided you have a good sharp knife so you can slice the cabbage thinly. It’s a nice change of pace from typical mayonnaise-based slaws (not my fave.) 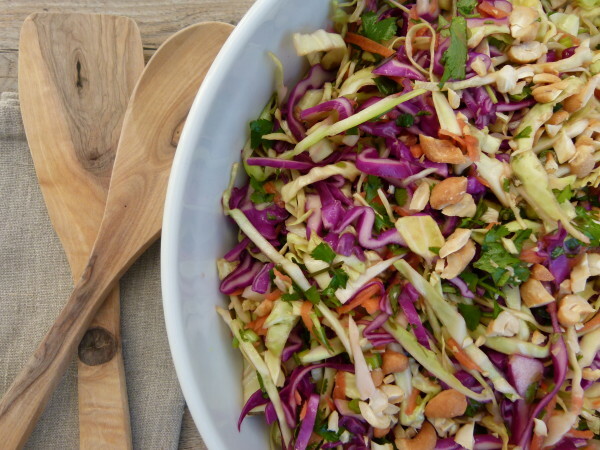 If you don’t have a nut-free house, definitely add the cashews as that was my favorite part of this salad. Otherwise, try toasted and salted sunflower seeds. It was great paired with a piece of simply roasted fish and baked sweet potatoes. Leftovers were still delicious the next day with a quinoa, sugar snap pea and cilantro salad. With St. Patrick’s Day coming up, cabbage will be really cheap, so stock up and cook up some news ways to enjoy this tasty and versatile veg! Place all the vegetables in a large serving bowl. 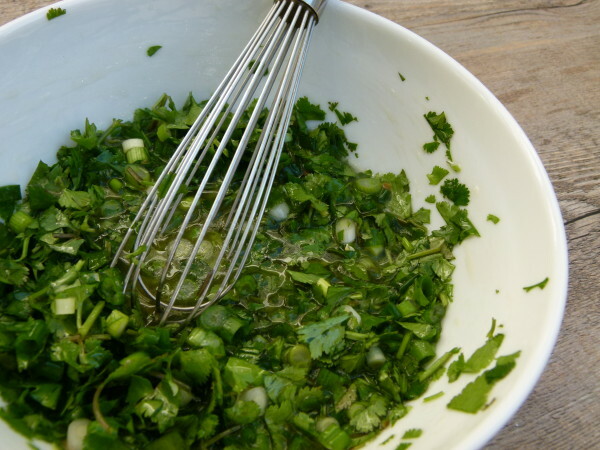 In a small bowl, whisk together the sesame oil, olive oil, scallions, cilantro, and lime juice, and season to taste with salt. Pour the mixture over the cabbage and toss well. 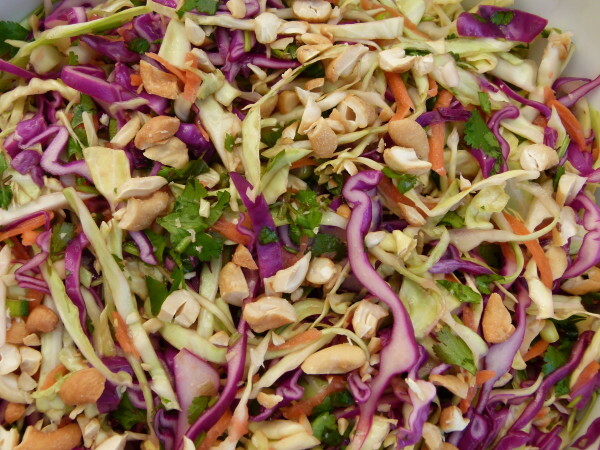 Let the slaw sit in the refrigerator for at least 30 minutes. Garnish with cashews before serving. Any leftovers can be stored in refrigerator for up to 4 days. I felt as though it could have used a little more dressing, so I would add the dressing to most of the cabbage and then add more cabbage until you feel as though you have the balance of cabbage to dressing that you’re looking for. Looks great plan to make it! I too prefer this lighter version without all the goopy dressing. Question: I tried to locate Mark Hyman’s cookbook you referenced as just out but Amazon lists a 2013 publication date. Is there a newer 2018 or 2019 book out? Thanks! Oops disregard my question I see the 2013 dates. Thanks. This type of salad is a favorite! I always like to add oranges to mine! So delicious…Adding sesame seeds to the dressing also adds more nutrition and texture! I make similar salad.I add some sesame seeds and pomegranete seeds to the salad.for dressing i also use rice vinegar ,sesame oil and some olive oil.I love it! Oh I bet pomegranates look gorgeous in this salad! And sesame seeds are a great suggestion, too. Thanks, Hila! I make something very similar, but usually add a little grated (on a microplane) ginger with the dressing. I have also used Rice Vinegar instead of the lime juice at times. It’s such a wonderful mixture it’s pretty adaptable to dressing whims. I bet this would be delicious with ginger. I’m glad you mentioned the rice vinegar as I use this in place of lime juice very often, as well! Thanks for the comment!! i just made this for lunch! so delicious. I have been searching for a mayo-free cabbage recipe with an asian flair (that doesn’t use ramen seasoning). This is it! thank you.